Standard Delivery is included in the price of the wetsuit hire and is usually a 3-5 working day service. This is a next day service if the Item is ordered before 2pm (subject to stock). MyWetsuit Hire offers wetsuit hire of the latest wetsuits from the top brands in swim and triathlon. You can hire from 2 weeks to the Full Season and if you are unsure or are over whelmed by our impressive range your can us the Quick Hire option give us some information and we will choose the most appropriate wetsuit for you. Before you choose your first wetsuit, we urge you to take a look at the document, available here in order to help you make the most informed decision possible that is best for you. If you prefer to purchase the wetsuit after the triathlon or the season then you can be confident that, if well looked after, this suit will last for many years. 2XU wetsuits carry a 2 year warranty. If you are pleased with your wetsuit you can purchase it at the end of the rental. Alternatively we offer immediate purchase at Wetsuit Purchase from My Triathlon. We have found that choosing the right fitting wetsuit is not straight forward. The Sizing charts are not easy to interpret especially when some brand come out too large and others too small. We take the randomness away by sending you the right fitting wetsuit. We will contact you, usually by E-mail if we think you have selected the wrong size. All Season Hire wetsuits are current season suits. Many rental companies will try to offer lower prices by providing you with a used wetsuit. Mywetsuithire enables you to test a new wetsuit and then choosing to purchase after the rental period. Why should I use a Tri specific Wetsuit? A triathlon wetsuit is designed for swimming. The flexibility around the arms is incredible and will not impede your swimming. A triathlon wetsuit also fits extremely closely! Novice's initial reaction when putting their wetsuit on is that it is too tight on the chest. Any tightness will immediately disappear as soon as you enter the water. If the wetsuit is comfortable on the land then the chances are that it is too big for you and will scoop up water when you start to swim. Practising in a wetsuit in the weeks prior to the race is very important and will alleviate any fears you may have. Hiring a wetsuit in advance of the event will allow you time to practise in it. A wetsuit is a valuable item that can get damaged or not returned. In order to protect ourselves in some circumstances we ask for a deposit that is fully refundable when the suit is returned clean and undamaged. Over 70% of season hires like the suit so much that they retain the suit. 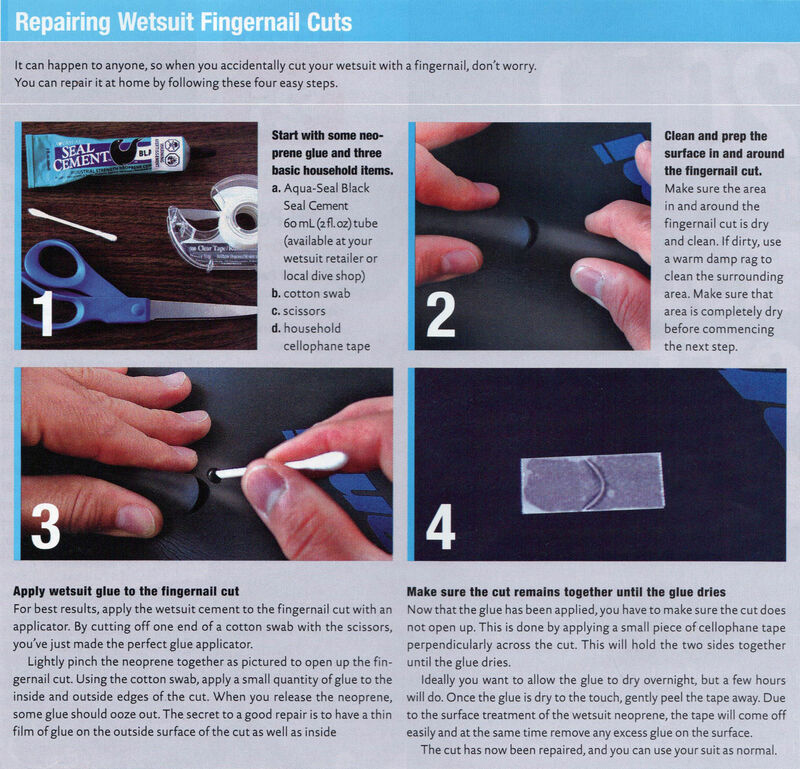 What should I use for wetsuit repair? TOP TIPS for putting it on! A wetsuit should be put on when you are dry. Nails should be cut & not sharp. Remove watches or jewellery. Use plastic bags over the feet, and hands to help when putting it on. Or wear socks! Avoid nail contact with the rubber - use finger tips! Pull legs on first as far as you can, then pull on the upper body of the suit. Triathlon specific wetsuits are fragile race equipment and require careful use. The suits are made to put on slowly, wearing socks and allowing enough time could help to get the suit on correctly. Take care not to "chip" or snag the surface of the suit with your fingernails. Race wetsuits are made to take off quickly when done correctly. Use a lubricant (e.g. Bodyglide but NEVER Vaseline). Watch a great video – this video will ensure you get the right fitting wetsuit and will help prevent damaging the wetsuit. You should wear under your wetsuit whatever you will complete the rest of the race in. You can race in any clothing you feel comfortable in, and most will wear cycling or tri-shorts, tri-suit or a swimming costume which they will keep on for the duration of the race. Everything will dry very quickly when you start the cycle. You can also keep your race top by your bike in transition to put on before the cycle. Tri-suits are designed specifically for swimming, biking and running. They dry quickly, provide sufficient padding and will prevent chaffing in certain areas. Our order process asks you for your height and weight. In the instance of short & fat or tall & thin go by the weight for the former, and height by the latter! i.e. A heavy person can't wear a wetsuit that isn't wide enough, but can wear when it is too tall. Please be accurate and honest with your sizing. Can I change my size once I have hired the wetsuit? 1) Everyone that is not used to triathlon wetsuits will find them uncomfortably tight when they put them on! They are not like other wetsuits. 2) The wetsuits give once in the water. All new and hire suits, when sent out have been checked for damage, prior to packing, and are therefore in perfect condition when they leave storage. This charge covers the cost of checking the suit is in excellent condition, packing & Postage. Postage is by courier and requires someone to sign for the package, so we recommend that you specify your place of work unless someone is permanently at home.